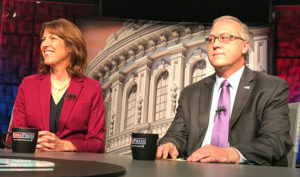 Cindy Axne and David Young. Vice President Mike Pence is scheduled to be in Des Moines tomorrow afternoon to campaign for Republican David Young, the incumbent in Iowa’s third congressional district. Cindy Axne of West Des Moines, Young’s Democratic opponent, says Young should use the occasion to lobby Pence. “I think it’s an opportunity for David Young, candidate David Young, to step up and be a congressman and ask this administration to put a stop to these junk health care bills that they’re putting together,” Axne says. In July, Young wrote a letter to the U.S. Secretary of Health and Human Services to register his opposition to so-called “skinny” health plans that will not cover individuals with pre-existing conditions. Young said people with serious illnesses need access to affordable policies. Axne says Young needs to go further and pledge to vote for legislation that would overturn the Trump Administration’s extension of what she calls “junk plans” that deny coverage to people with pre-existing conditions. Pence will be making his second campaign stop for Young tomorrow. President Trump publicly endorsed Young at a rally in Council Bluffs last week.